In a large saucepan, combine the tomato sauce, chili powder, onion powder, garlic powder, dried oregano, dried cumin, and sea salt. Bring to a simmer on medium-high heat, stirring occasionally. While the sauce heats, in a skillet heat the oil. Add the onion and cook, stirring occasionally, until it is soft, about five minutes. Remove both the onion and the tomato sauce from the heat. In a small bowl, mix the olives, onions, and diced chilies. 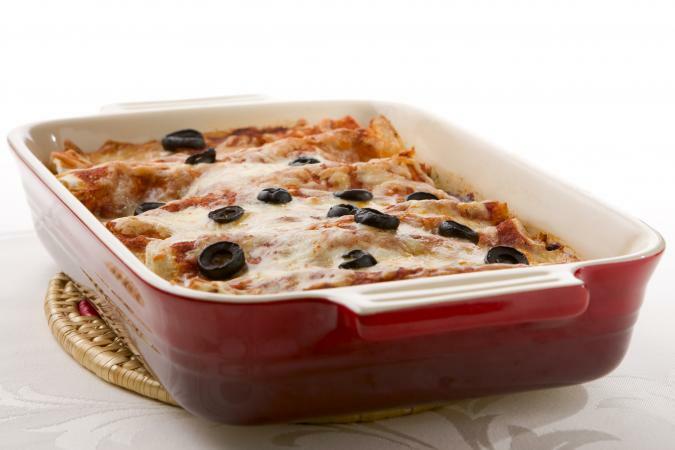 Spread about 1/4 cup of the sauce in the bottom of a 9x13-inch rimmed baking pan or lasagna pan. Spread 1/3 of the olive mixture over the tortillas and sprinkle with 1/2 cup of the cheese. Pour 1/2 cup of the sauce over the cheese. Dip more tortillas in the remaining sauce and put them on top of the bottom layers in a single layer. Repeat steps six and seven, making two more layers of sauce, olives, cheese, and tortillas, and finishing with a layer of soaked tortillas. Pour any remaining sauce over the top of the tortillas and sprinkle with the remaining cheese. Cover with foil and bake in the preheated oven for 30 minutes. Uncover and cook 30 minutes more until the cheese is bubbly. Replace the olives with 2 cups of finely chopped seitan that you cook with the onions. Omit the diced green chilies and instead replace with canned corn. Replace the olives with 2 cups of drained, cooked black beans.